~TECH-BYTES~: Google Launches Orkut Apps...For Estonia? Google Launches Orkut Apps...For Estonia? While I am underwhelmed over the fact that Google selected Estonia to test out their Orkut Apps (instead of Brazil, India, or even the US), users will now at least have the option of checking out the latest Orkut Apps without the need to register for the Orkut Sandbox (Google's beta site for Orkut). In order to test these apps for themselves, users first have to visit their Orkut home page (which is orkut.com/Home.aspx) and click on the edit link located underneath your profile image section. Note: You can also click orkut.com/EditSummary.aspx which will bring you there as well. 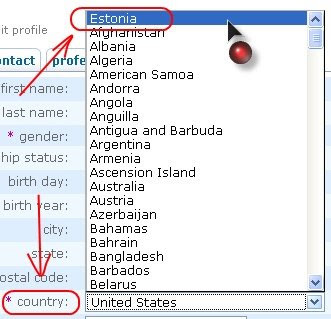 Next, locate the menu bar that asks you for your home country and change it to Estonia. Then click the update button at the bottom of the page. Once you are finished, simply scroll over to the Orkut App Directory (which you can find over at orkut.com/AppDirectory.aspx and add any feature that you desire. Currently Google is only displaying a grand total of 15 Apps, although you can find more over at Osocial.net. Hopefully Google will allow other countries to test these apps outside of the beta site, not to mention introduce a few (hundred) more apps onto Orkut. Orkut Apps For India, Estonia...Who's Next?